The patio area is the perfect place for families to get together and have fun when the weather is nice. Almost every activity can be moved outdoors, whether it’s checking email or even eating dinner. In order to do this, the patio needs to have ample seating, lighting, and storage or tables. Some may already have this, but if they don’t it’s very easy to create by adding just a few simple pieces of furniture. Seating is often considered the most important part of creating a great patio for the family, which is why many have at least a few lawn chairs or lounges outside for them to use. The problem with lawn chairs and lounges is that they tend to break or rot, prompting the need for new ones nearly every year. This can get expensive, especially if they are using heavily since they will wear out faster. One of the best options for long lasting outdoor seating is bean bag furniture that is rated to be used outdoors. The reason for this is that they are typically waterproof and are made from a high-density fabric so they last longer. After purchasing the outdoor bean bag furniture, the next step is to actually set up the seating area. Some may prefer to use a more traditional setup, such as four chairs and a table. Another option is to group the chairs around smaller tables or stands to create a more open and free-flowing space. Either option will work; the main goal is to simply find something that works with the available space. If grouping the chairs in smaller arrangements is better for space, make sure to put a small table or stand nearby so that family members have a place to put their drinks or snacks. Those who prefer a more traditional style may find it is best to arrange the chairs around a long or wide table so that the family can eat meals outdoors, or even play board games together. 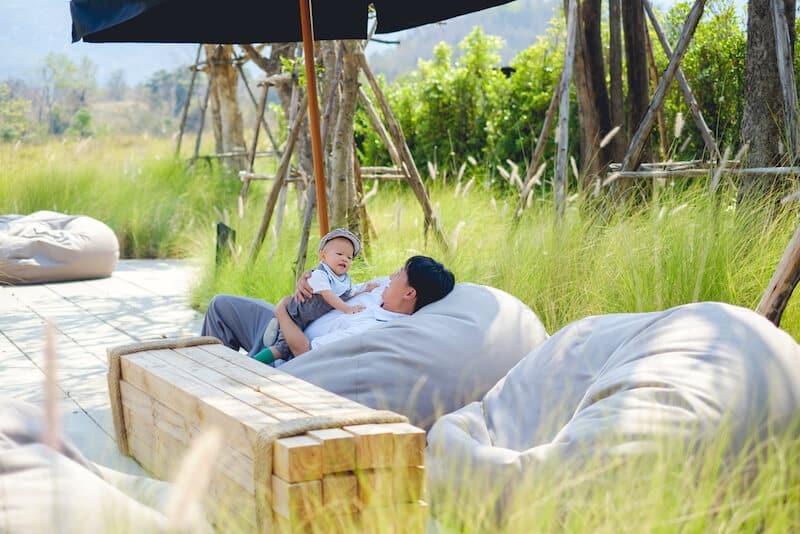 One thing to keep in mind when doing this is that the bean bag outdoor furniture may not be tall enough to reach the table unless it is either adjustable or relatively low to the ground. One way to deal with this is to look for seating that is slightly taller, or has a more defined shape so that the chairs do not sink down when someone is sitting in them while at the table. The final step to transforming a patio into a great outdoor space is to add weather resistant lighting to it. The lighting can take on one of many forms such as strands of lights, torches, or even a small fire-pit. Lighting that features some form of insect repellent, such as citronella torches, can be very useful if insects are a major problem during warmer months to help ward off the mosquitoes. One thing to keep in mind with torches or fire pits is that the bean bag furniture should be kept away from them so that they do not get damaged or covered in soot or ash.